U Gambira in an article published in The Washington Post on the same day – Nov. 4, 2007 – that he was arrested by military police in Sagaign (upper Burma). As he wrote this he was a fugitive following the deadly September 26-27 crackdown on pro-democracy protesters in Burma, known as the Saffron Revolution. The regime already had arrested his father and brother, holding them as hostages to force him out of hiding. They were searching for him everywhere, left no stone unturned. As one of the key leaders of the movement, Ashin Gambira was campaigning among the monks since 2005. While studying for Dhammacariya class he became increasingly aware of people’s suffering, the poverty, lack of education and the decay of the religion in his country. U Gambira (a pseudonym, his lay name is Nyi Nyi Lwin, his clerical title is U Sandawbartha) worked tirelessly. Writing articles, sticking pamphlets at night on walls. Moving constantly from one monastery to the other organizing and connecting with other monks. 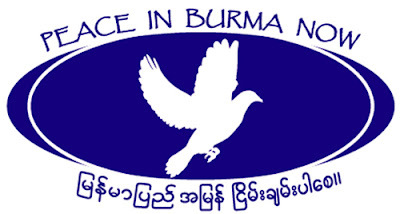 In a country like Burma where the brutal military regime has silenced and cracked down on every peaceful opposition since more than 40 years this means being at risk of arrest at all times. Living with a false name, observing your surroundings, not to trust anyone. Born on 19th June, 1979, in Kaing-leh village, Pauk Township, Magwe Division as the fifth child with seven siblings, he became a novice monk at the age of 12. After the 1988 democracy protests his father and brother were arrested and schools closed for 2 years, Ashin Gambira ran away from home and became a child soldier. His parents found him in a military base in Yangoon and brought him in fear of imprisonment to the nearby monastery. He is a deep lover of his own country and people, he is devoted to justice and freedom. He abhors oppression, loves books. He is interested in English language and computer technology. He set up a library in his home town and donated books to libraries all over the country. When on 15 August 2007 the government doubled the prices of petrol and diesel, the cost of compressed gas to power buses increased five-fold. This hit Burma’s people hard, forcing up the cost of public transportation and the prices for rice and cooking oil. Monks in Pakokku came out of their monasteries and took to the streets in a protest, chanting the Metta Sutra. Armed government troops fired warning shots into the air and beat, arrested and disrobed three monks. This incident let to an urgent meeting of the newly built All Burma Monks Alliance. U Gambira together with Ashin Issariya, Ashin Pannasiri, U Obhasa, U Khemeinda and U Zakada had been meeting regularly since the beginning of 2007. They issued a statement asking the military junta to apologize for their actions and calling for dialog with the democratic forces inside the country until September 17th, but the military refused. 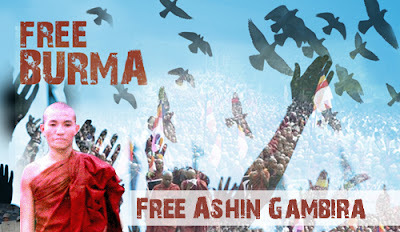 So Ashin Gambira and his friends organized mass demonstrations around the country by sticking pamphlets at monasteries at night, asking all monks to join the boycott of the military regime. U Gambira gave radio interviews and spoke to the BBC. He became the well known leader of the movement. He could not have known how many monks would follow the call. The protests grew stronger each day, spread across Burma, Yangoon, Sittwe, Pakokku and Mandalay. More than 100,000 people demonstrated in Yangoon, making it the largest anti-government protest in twenty years. To crack down on the movement the junta security forces began raiding monasteries at night across the country, arresting and beating monks, shooting monks and lay people on the streets. Forcing many monks to disrobe and flee for their lives. There was no safe place anymore. Reports stated that up to 10,000 people, many of them monks who led the protests, had been “rounded up for interrogation”. United States diplomats who visited 15 monasteries found them empty, while others were being barricaded and guarded by soldiers, the report said. U Gambira said this to Alan Clements in October 2007 in an interview with his mobile phone. He had not expected the generals to brutally massacre monks, students and people. “Whenever he recalled the atrocities, he suffered nervous tension and his health weakened. In spite of poor health, he had to keep up the momentum of the uprising while evading and hiding from arrest” . His colleagues and friends urged him to flee the country but he refused. When he was arrested on November 4th, he was forcibly disrobed and put in solitary confinement. He has been charged with treason and sentenced to 68 years in prison (later reduced to 63). On 19 January 2009 his family heard reports that he had been staging a hunger strike since 13 January. He had been refusing food and water and could only lie on his bed as he was getting so weak. He passed on a message of support through his mother to human rights and democracy activists in Burma to keep fighting for change in the political system on 16 March “He reiterated that he was continuing his fight for the people of Burma whose rights were being abused by the government,” said Daw Yay. “He reminded everyone to fulfil their duties.” He also told her that he is longing for internet and tea. “I wish to move around freely, I want to drink tea and need one more year to complete my studies etc. But I don’t mind having sacrificed my freedom and I’m still struggling” he was quoted as saying. On 27 May 2009, U Gambira was transferred from Khandi prison to Kale Prison, in Sagaing Division. He had staged a protest by shouting and demanding a face-to-face meeting with Snr. Gen. Than Shwe. He was in very poor health, suffered from asthma and bronchitis.